It's "all hands on desk" during a lab session measuring electricity with voltage meters in “Principles of Engineering” with teacher John Takach. 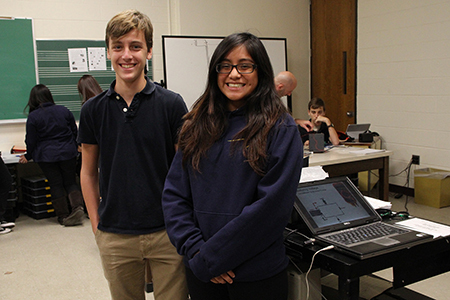 Class President Rachel Soto-Garcia, right, and Christian Johnson, whose twin brother is also in the class, say that hands-on problem-solving is a challenging and fascintaing way to learn. West Windsor, N.J. – With hands-on design, problem-solving tasks, and real world experience as centerpieces of the curriculum, the STEM (Science, Technology, Engineering, Math) Academy at Mercer County Technical Schools (MCTS) is offering a different kind of high school education -- and it’s happening in partnership with Mercer County Community College (MCCC). According to MCTS Supervisor Marcie Tandy, the rigorous, innovative curriculum is preparing the next generation for STEM jobs, which are projected to grow to more than 9 million through 2022, according to the Bureau of Labor Statistics. In this unique MCTS-MCCC partnership, students spend their school day on the college’s West Windsor Campus and can earn up to 32 college credits on the way to their high school diplomas. After MCTS received a $300,000 grant from the N.J. Department of Education in Spring 2015, the STEM Academy accepted its first class of 19 ninth graders that fall, a group that remains together currently as sophomores. This year’s 9th grade class includes 29 students and applications for next fall are steadily coming in. The selective application process includes middle school transcripts, standardized test scores and an interest in STEM. 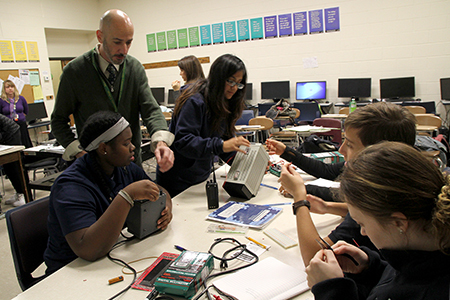 According to STEM Academy instructor John Takach, who is teaching “Principles of Engineering” to his STEM sophomores this year, the curriculum revolves around problem-solving, a key skill in the engineering and electronics fields. “Students learn to teach themselves by experimenting. I have found that students are eager to accomplish their tasks and figure out how to get there. There is nothing better than seeing the ‘ah-ha’ moments,” he said. Takach is a former industry professional who says that U.S. manufacturers are hungry for talent. The Academy's students take their classes as a single cohort and benefit from resources available at MCCC, including courses in Computer-Aided Design in 9th grade and 3-D Printing in 10th grade with an MCCC instructor. They are fulfilling their physical education requirement in an MCCC dance class. In the next two years, they will take courses in Mechanical Engineering Technology and Advanced Manufacturing Technology. By the time they are seniors, they will have completed the majority of their high school graduation requirements through college classes in English, math, history and more. While students leave their home school district during the day, they can still pursue extracurricular activities back at their sending high school. STEM Academy sophomore Christian Johnson returned to Steinert High School this fall to appear in the school’s musical, “Anything Goes,” and is on the lacrosse team during the winter and spring seasons. Rachel Soto-Garcia of Hamilton, serves as the academy’s class president and says she would recommend the program to anyone. "It’s fascinating to figure out solutions to problems. I love designing and learning how things work,” she said, pointing to a recent assignment where students used meters to measure voltage and see how electricity flows. In a previous assignment they built a moving model car. Soto-Garcia first considered applying to MCTS’s Health Science Academy for a possible future in medicine, but decided the engineering field offered even more possibilities, especially for women. She hopes to attend Drexel University after high school. “My classmates and I are serious and focused,” she said. “If you are the type of person who likes to think outside the box, this is a great program.” And, Soto-Garcia still gets to participate in after-school sports at Nottingham High School. In addition to occupational outlook data, the district decided to focus on the STEM disciplines based on anecdotal evidence provided by local business partners. "It's our obligation to prepare our young people for the multitude of STEM career options that will be available to them. We're working closely with MCCC and our lead business partner, KNF Neuberger, Inc. of Hamilton, to offer the most relevant career and technical education program that we can," said Dr. Kimberly J. Schneider, Superintendent of the Mercer County Technical School District. For more information about the STEM Academy, visit www.mcts.edu.